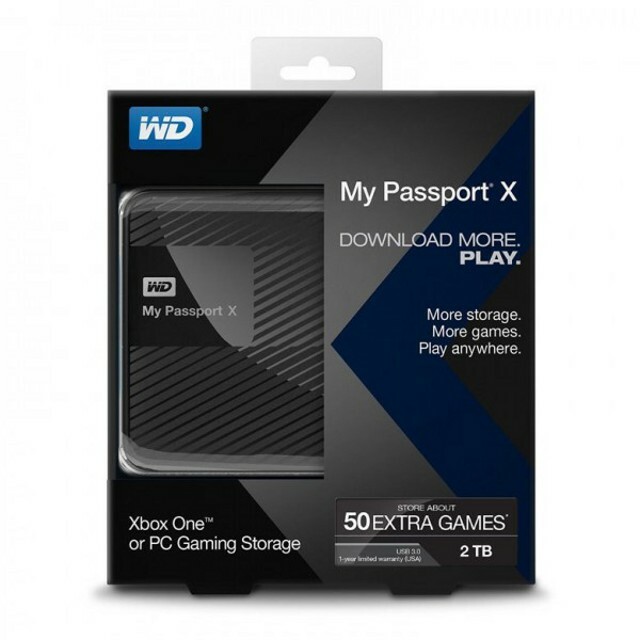 The My Passport X from Western Digital is aimed at Xbox One and PC gamers looking to increase their storage capacity. We’ve been testing the 2TB edition of the drive out with the Xbox One. One concern we had when the Xbox One launched was that it only shipped with a 500GB Hard Drive. Out of the 500GB Microsoft only allow you to use around 362GB which still sounds like a lot until you consider the size of the latest games. It’s not uncommon now for a game to surpass 10GB in size and many of the bigger titles such as Halo: The Master Chief Collection or Destiny are taking over 50GB of space. This means you can easily fill your internal drive with as little as ten games. Sure it’s possible to delete a title and reinstall later but it’s a lengthy process that wastes valuable gaming time. Microsoft have tried to combat the issue with a larger 1TB Xbox One but that Hard Drive is only going to give you space for twice as many games. Fortunately they also let you attach an external drive to store and play your games via USB 3.0. The My Passport X 2TB is USB 3.0 compatible and gives you over four times the storage of the original Xbox One. Taking the drive out of the packaging is simple and takes just a few seconds. Inside you’ll find the My Passport X drive, a USB 3.0 cable and a small instruction booklet. The drive is nice and small measuring approx 11cm x 8cm x 2cm. It fits nicely in your hand or pocket and will also sit neatly on top or next to the Xbox One. The drive has a nice matte black finish with a glossy textured top that also has a small Western Digital My Passport X logo. The bottom of the drive features four small rubber feet, these give it a little grip and ensure it doesn’t go sliding off somewhere. Connecting the drive is very easy and simply requires you to plug in the included cable to the drive and Xbox One – there is no external power adaptor needed. The Xbox One then detects the drive and takes you through setup which is really quick. The only thing you need to think of is a name for the drive. We went for the imaginative name of Xbox Two but you could call it pretty much whatever you like. Once this is done you can decide in the Xbox One settings which is the default drive to install games to. If your internal drive is close to full then it’s worth pointing the console at the My Passport X. Games that are installed already on your console can be moved individually between the console and the My Passport X or vice versa. When in the My Games and Apps screen the Xbox One gives the option to view installed items on all drives. Doing so you’d never even know an extra drive was connected. You can also filter by drive just to see what is installed on a specific device. Running the games from the My Passport X compared to the internal drive can also give you slightly quicker load times. Another benefit of installing your games to the My Passport X is that you can take it with you. Should you visit a friend or have a second console you can simply plug the My Passport X in, sign-in to the console and then play your games. The Western Digital My Passport X is an excellent choice for Xbox One gamers looking for additional storage space. The drive is a breeze to install and a perfect upgrade for any Xbox One gamer. The drive also works with the Xbox 360 and is a great choice for PC users looking for additional storage or a portable backup solution.